Liberal Tory Coalition | Ipswich Unemployed Action. Tories Cut Benefits to win Popularity. Clegg and Osborne Enjoy a Special Moment Together. This says it all . Exclusive: Former deputy PM says ‘cynical’ ex-chancellor was not bothered about human consequences. Nick Clegg has accused the former chancellor George Osborne of casually cutting the benefits of the poorest people in society because he believed taking the austerity axe to welfare would boost Conservative popularity. In a candid interview looking back on his five years as deputy prime minister in the Tory-Lib Dem coalition, Clegg said he found the behaviour of his senior Conservative partner “very unattractive, very cynical”. “Welfare for Osborne was just a bottomless pit of savings, and it didn’t really matter what the human consequences were, because focus groups had shown that the voters they wanted to appeal to were very anti-welfare, and therefore there was almost no limit to those anti-welfare prejudices,” he told the Guardian. See the Comments. (4080 at the time of writing this post). This doesn’t surprise me. The vermin’s support base practically put the bunting out whenever cuts are aimed at the unemployed, single mothers or working poor but cry like babies when the nice to have freebies are taken away for the affluent old. The Tory support base are nasty pieces of work. There is a section of the electorate who’ll vote Tory not in spite of them being a hateful class war party with no compassion for the weakest but because they are a hateful classwar party with no compassion for the weakest. These people complain when they are called out on their behaviour. Its amazing what short memories some people have when it comes to state benefits. In fact he consistently helped the rich – and he did it by hurting disabled people. Welfare Reform: Iain Duncan Smith Trumpets Success. Some of those ‘Benefiting’ from Iain Duncan Smith’s Reforms. Saturday April 25th. Express and Star, Wolverhampton. The architect of the controversial ‘bedroom tax’ has insisted low and middle earners have benefited from his welfare reforms. Work and Pensions Secretary Iain Duncan Smith slashed millions from the welfare bill as the coalition government sought to balance the books. But he claimed these savings, alongside the falling number of people claiming certain benefits, had allowed the coalition to introduce tax cuts for those on low pay. From this month the tax-free personal allowance threshold on income tax increased to £10,600. Speaking in Walsall, Mr Duncan Smith said: “What I have been doing now for a number of years is reforming welfare as a means to making more people better off. “The reforms have not just saved tax payers money, including those on low and middle incomes, we have actually been able to give them tax cuts by raising the threshold on the personal allowance on income tax. Mr Duncan Smith, who led the Conservatives for two years during Tony Blair’s New Labour government, was at Nova Training in Goscote where unemployed young people are taught skills to help them secure work. Fuel banks pilot scheme aims to address austerity-era dilemma of ‘heat or eat’. Fuel voucher for families who use prepayment meters will be available to those in crisis referred to food banks by welfare advice agencies, GPs and social workers. Families in poverty who are forced to switch off their gas and electricity supply because they are unable afford spiralling energy bills will be offered free charity fuel vouchers under a pilot scheme. The so-called “fuel banks” initiative will provide a £49 credit for struggling families who use prepayment meters in a move designed to address the austerity-era dilemma of “heat or eat”. 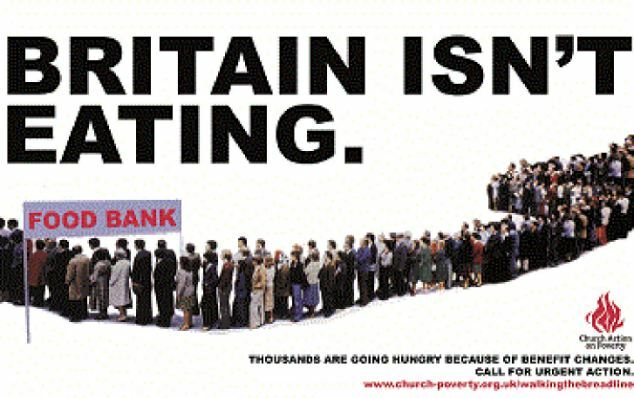 It is being run by energy firm nPower and poverty charities including the food bank network Trussell trust. The vouchers, which will provide enough credit to restore power, and keep lights and heating on for up to two weeks, will be available to people in crisis referred to food banks by welfare advice agencies, GPs and social workers. Benefit-Related Suicides: DWP Forced to Open up? Not to Escape Responsibility for Deaths. 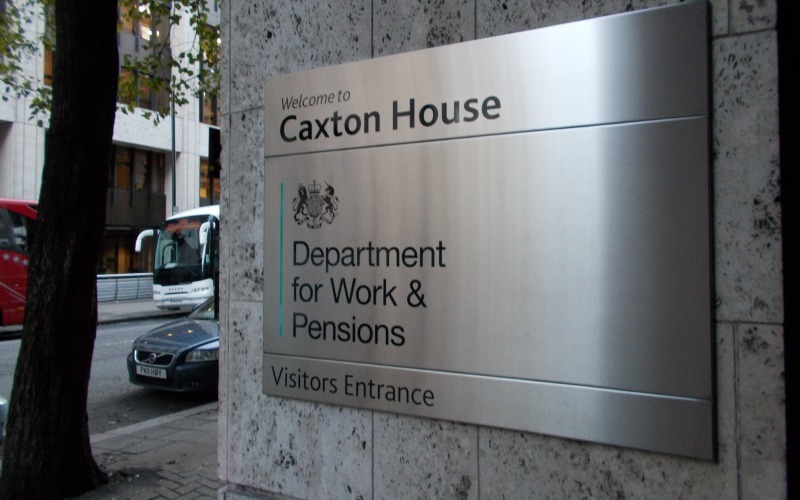 The Department for Work and Pensions (DWP) is facing an investigation into its refusal to publish ‘secret’ reviews into 49 benefit-related deaths, it has been reported today. The investigation was launched by the Information Commissioners Office following a complaint from Disability News Service (DNS). A number of Freedom of Information (FOI) requests, including from DNS, demanding that the DWP publish its reviews into benefit-related deaths have been rebuffed by the department. Officials have since admitted that of the 49 reviews the DWP has carried out so far, 33 included a recommendation to make improvements and 40 were made in response to an apparent suicide. The DWP says publishing the reviews could represent a breach of section 44 of the Freedom of Information Act; which states that it would be an offence for a DWP employee to, “disclose without lawful authority any information which he acquired in the course of that employment and which relates to a particular person”. A complaint from DNS has now sparked an investigation by the information watchdog. Just now we learn: Information commissioner to force DWP to be transparent about investigation into benefit-related suicides. Third Force News. England’s information commissioner is to launch an investigation into the Department for Work and Pensions (DWP) “refusal” to reveal reviews into 49 benefit-related deaths. It comes after the DWP refused several requests to publish the information saying publishing the reviews could represent a breach of section 44 of the Freedom of Information Act. The act states it would be an offence for a DWP employee to “disclose without lawful authority any information which he acquired in the course of that employment and which relates to a particular person”. However, a complaint by campaign group Disability News Service (DNS) has launched an investigation by the watchdog. 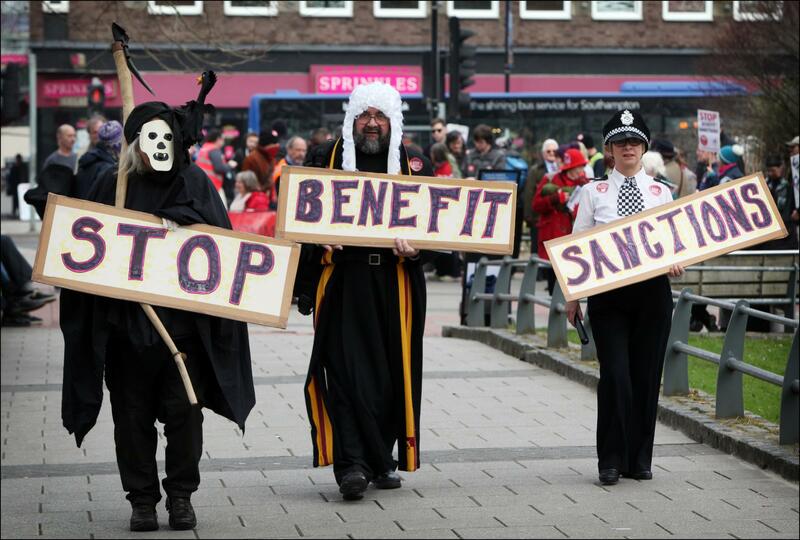 Campaigners believe sanctions and cuts to benefits have been so severe many claimants – especially those with mental health problems – have taken their own lives. The investigation will take a number of months to conclude but in the event investigators rule against the DWP the decision can be appealed. A spokesman for the information commissioner’s office said: “The focus of my investigation will be to determine whether the DWP is entitled to rely on section 44 as a basis for refusing to provide the information you requested. As the so-called opinion polls saying that 99.9% of people back sending unemployment out to clean the streets with their toothbrushes and beg for charity in Food Banks cover the pages of the Sun, the Mail and Express, spare a thought for the poor bastards who’d had enough of all that – and ended up in these “events”. UK Poor are Worst off in Western Europe, Closer to Poor in Former Eastern Bloc. Future for the Poor Under Tory Rule. This story by Danny Dorling deserves wide attention. In the main parties’ election manifestos published this week, public spending is still public enemy number one. The Conservatives insist that a further £12bn in cuts to the welfare budget must be found over the course of the next parliament. If it isn’t, they warn, then the hordes of so-called skivers who receive unemployment benefit, child support, or disability benefits will keep draining Britain dry. What is the reality of life for the worse off in the UK? The poorest fifth of the UK population are significantly worse off than the poorest fifth in other Western European countries, according to analysis of Organisation for Economic Co-operation and Development (OECD) data published by the High Pay Centre think-tank today. The High Pay Centre examined the ‘OECD Better Life Index’ which estimates the average net disposable household income for the world’s richest economies, as well as the average for the poorest and richest 20% of the population in each country. In the UK, the poorest fifth of the population have an average income of just $9,530, much lower than the poorest fifth in other North West European countries such as Germany ($13,381), France ($12,653), Denmark ($12, 183) or the Netherlands ($11,274). In fact, the poorest people in the UK are closer to the poorest in former Eastern bloc countries Slovenia and the Czech Republic than to the poor in Western Europe. This is despite the fact that the OECD estimates average incomes in the UK ($25,828) are similar to Denmark ($25,172) and the Netherlands ($25,697). The UK’s average is inflated by the incomes of the top 20% of the population – at around $54,000, the third highest in the EU. In Belgium, the Netherlands and the Nordic countries, the top 20% make between $44,000 and $49,000. High Pay Centre Director Deborah Hargreaves said: These figures suggest we need to be more concerned about inequality and how prosperity is shared, as well as average incomes or aggregate measures like GDP. The fact that the rich are richer in the UK than many other countries hides the fact that the poor are poorer. Most people think our living standards in the UK are similar to economies like France and Germany, but being poor in the UK is more like being poor in the former Soviet Bloc than in Western Europe. …the government’s plans to rapidly reduce the proportion of GDP spent on public services to 38% by 2019 mean that after 2015, the UK would leave the second division of European countries by public spending and enter the third division alongside Ireland, Estonia and the Slovak Republic. A UK in this league would become more similar to these countries. It could become a place from which the young try to emigrate and in which the old are not well cared for, in which people on average live shorter, more brutal and less valued lives. Disabled People Against Cuts: Revenge Tour. Watch Out IDS and Esther McVey! A fortnight of Fight Back and telling politicians throughout the UK what we think of them and what they MUST do if they want our votes. Everywhere from April 18th – May3rd. Select your favourite politician or issue to campaign on. Some funding is available for travel bursaries with priority given to members. April 23rd (Thursday) National DPAC will be going to Wirral West constituency to visit Esther McVey. Meet noon at the Job Centre, Market Road, Hoylake. Esther’s constituency is very marginal and at the moment she looks set to lose her seat. We want to help facilitate that. April 25th (Saturday) National DPAC will be going to Chingford to visit Iain Duncan Smith. Meet 2pm outside Chingford Rail station. Trains from Liverpool Street. Please get in touch with us at mail@dpac.uk.net to let us know if you want to go to one or more of these events or would like help with travel costs. Please also arrange your own events and send us details. Join and share the facebok page. 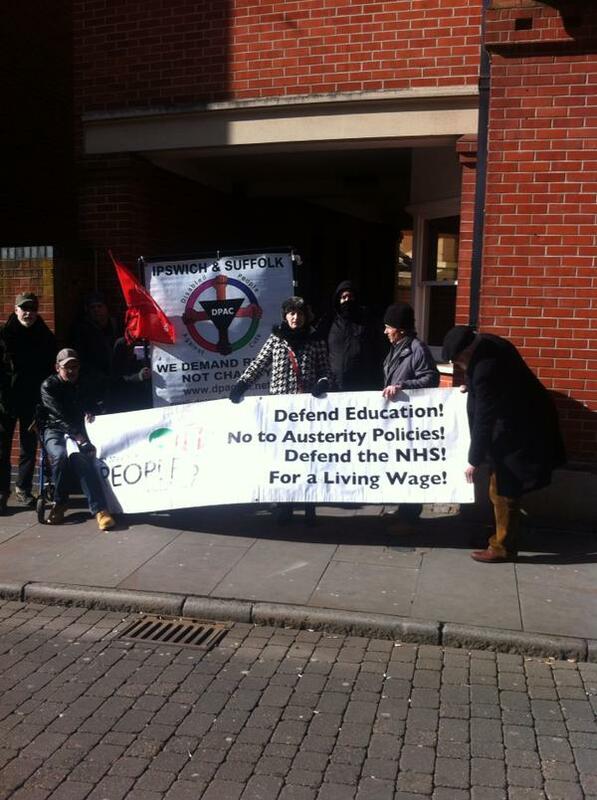 DPAC Protest in Ipswich with Suffolk People’s Assembly.